It’s not easy to watch someone suffer, whether it’s a person or a pet. At least to some degree, a person can tell you how they feel, or give you feedback on what’s working and what’s not. A dog is only going to look at you with adoration, attention, expectation, and unconditional willingness to please, even when they can’t. So it is with Buddy. The mass on his left shoulder is growing, and his leg is drooping farther. His homemade boot is just not enough. He wants to move. He wants to run. He tries. Every right legged hop-step he takes jolts his bad shoulder and leg. It puts me to tears. I cannot afford to take more drastic measures, nor do I want to put him through that rigorous process. It would not extend his life. What quality of life would he have for the short time he has left? If he could just have some support on that left side. I search and search online, looking for solutions, and come up with nothing. Why isn’t there a chest harness out there designed for supporting a “shoulder injury”? And then I looked at the Thundershirt. It’s a soft, thin, stretchy fabric body wrap you can tighten as needed. It wraps across the entire torso and captures both shoulders snugly in place with Velcro. While the purpose of the Thundershirt is to calm a dog experiencing general fearfulness, leash pulling, incessant barking, crate or separation anxiety, or anxiety due to storms, fireworks, travel, or if the dog is just plain manic, the actual design of the shirt could be just what we’re looking for. After explaining our situation, and confirming with our local Petsmart they had the shirts in stock, Buddy and I were on our way to the store. We hadn’t been shopping together in a very long time. Tail up, head up, ears perked, he knew right where he was. Hello Petsmart! The land of endless treats, crotches, pooches, and amazing, euphoric smells. What a happy dog. The folks at Petsmart were so very kind and helpful. They had several shirts waiting for us at the front of the store so we wouldn’t have to spend Buddy’s limited energy trying to find them. Buddy was so cooperative, and loved the attention. Two associates helped us figure out how to properly fit him. We tried on several sizes to zero in on the best results for our unique requirements. We tried pulling the shirt over to the left side to more fully enclose the lame shoulder, leaving his right shoulder more free. The minute we had the large camo style wrapped around his sweet frame, Buddy melted onto the floor in a puddle. “I think this is the one.” I said. What an incredibly kind gesture by the employee. Buddy looked up at me, perfectly relaxed and content to stay there on the ground in his shirt. He was standing in a flash. Off we go for a test walk. But within a few minutes, he relaxed into it, and seemed to not even notice it was there. The Thundershirt gently held his shoulders together, making his limp far less exaggerated. The shirt, combined with his homemade boot, seemed to help redistribute the weight and decrease the pain he was feeling. He bounded up and down several isles, sniffing the merchandise, flirting with a couple fine girl dogs, and showing off to other humans what a good boy he is. He even went on full point at the canaries! We canvassed the store, ending up with a cart full of dog food and a few special treats. He could have gone another round—he was a happy, not to mention relaxed, dog. And I was a happy customer. Just like when I would go grab the E-collar, Buddy perks up to attention when I reach for his Thundershirt. Instantly at my side, he knows it means we’re going on an adventure together, and stands ready to be fitted into it. I am so grateful for the Thundershirt. It takes away some of his pain, makes it easier for him to walk, calms him in the process, and is extending what is left of our quality time together. We’ll take those small miracles where we can find them. 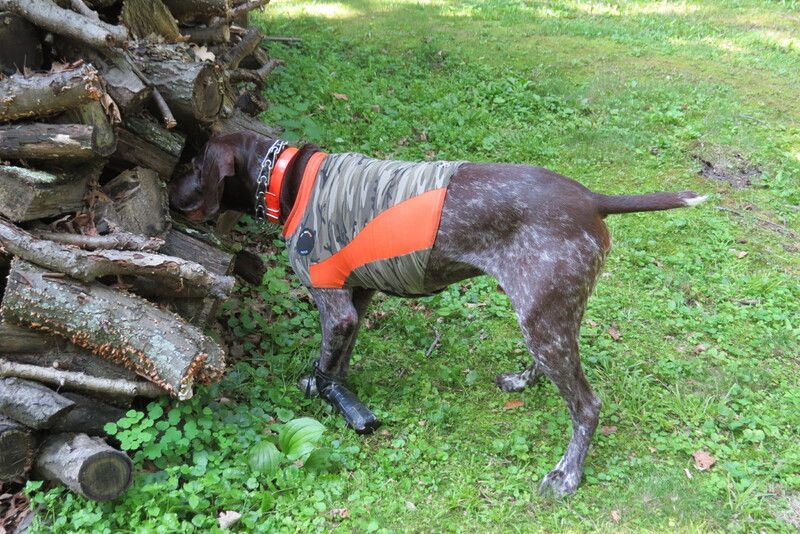 Thank you, awesome Thundershirt makers!